Sometimes it is desirable to move or copy email from the LIHQ mail server to local folders on your machine. 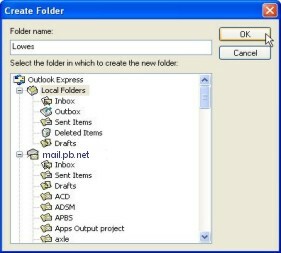 The following is one possible solution using Outlook or Outlook Express. These instruction are for a windows-based machines, but should you own a a macintosh interface should be similar. 1. 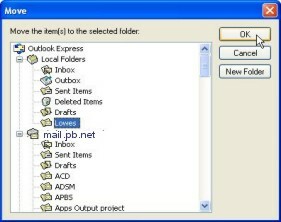 In Outlook or Outlook Express, right click on Local Folders, in the Folders column. 3. Type in a name for the new folder. You can use the same name that was used on the server to simplify keeping track of the original location of the message. 5. 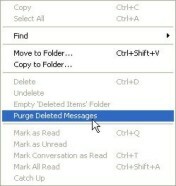 Under your inbox name select the folder you wish to copy/move a message from, this will display the individual messages on the right side of the window. 6. Highlight each message(s) you would like to copy/move. By holding the Ctrl key down and clicking on each message, you can highlight several messages at the same time. 7. Right click on the highlighted message(s). 8.Click on Copy to Folder or Move to Folder, according to your need. 9. Select the folder to copy/move them to, from the Local Folders list. The messages have now either been copied or moved from the server to the local folder(s). If your intention was to move message(s) from the server to the Local Folders, then you need to do one more step to actual remove the file(s) from the server. 1. Display the folder by highlighting it on the Folders list. 2. You should now see the messages with the lines through them. 5. Messages are now purged from the server.